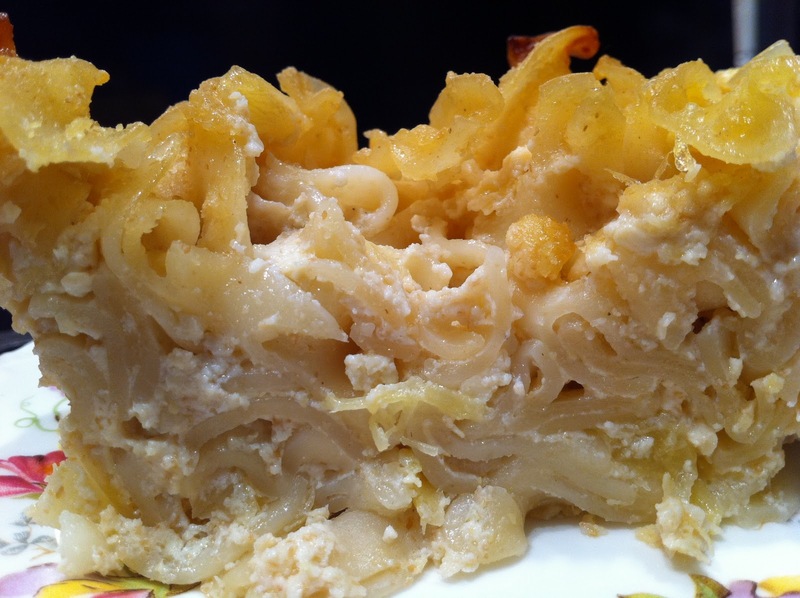 My mother’s noodle pudding (lokshen kugel) is probably the best thing she made for us every year on Rosh Hashana and Yom Kippur. I have successfully made it vegan. It took some trial and error but here it is! These measurements make a big casserole dish full of kugel! UPDATE September 2015: Use Kite Hill cream cheese and ricotta cheese instead of making your own! To make the tofu cream cheese, place the silken tofu in a clean towel, gather the ends up and twist and squeeze as much of the water out as possible. Crumble it into the food processor with the rest of the ingredients and process until smooth. Set aside. To make the tofu cottage style, press the tofu. When it is drained, crumble it and add in the rest of the ingredients. Mix well and set aside. Boil the noodles and preheat the oven to 350. Make the flax eggs and set aside until they are really creamy. Melt the Earth Balance. Drain the noodles. In a big mixing bowl, mix all of the ingredients well. Turn out into a baking dish and bake for 45 minutes to crisp up the noodles on top. Let the kugel cool and then slice. It is a sweet way to start the New Year! PS It is even better the next day right out of the refrigerator!